I had a request for fire engine books and I was happy to gather together an excellent selection of books dedicated to this very popular topic. So many little boys are obsessed with fire engines. They enjoy going to the fire house and visiting the fire fighters. They like to check out all the equipment, but mostly they really, really like the fire engines best of all. And when they can’t be out looking at fire engines they want to read about them! Check out the books below and be sure to stop by our best books for boys page to see more book lists. When my son was young we visited a fire station. He got to check out the pole, dress up in real fire fighter clothes and even use the hose. That hose packs a tremendous punch and is hard to control! We also got a tour of the station and got to see all the different fire trucks. The best part of all was getting to climb up into the fire engine and sit in the driver’s seat. 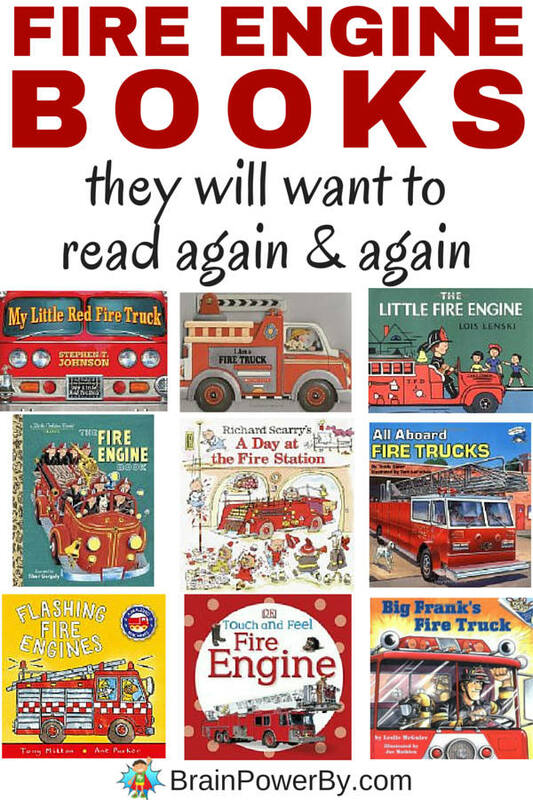 Here are some great fire engine books for you to share with your boy. Be sure to try a fire house tour as well. Pairing reading and hands-on experiences is a wonderful way to learn. The Fire Engine Book is a classic Little Golden Book reissue. It is oh so retro. The book features fire fighters at work as they get in their engine and race to the fire. Flashing Fire Engines offers explanations of what the animal fire fighters are doing as they go about their day. It is in a rhyming format that kids will really like. There are no light up items which is kind of what I thought when I saw the title. But there are a lot of fun words like wailing sirens, flashing lights and more. Touch and Feel Fire Engines by DK is great. I really like their Touch and Feel series for the realistic, excellent photos. They include a bumpy grill, rubber tires etc. to feel. There are fun books! This book had so many positive reviews I had to check it out. Join Big Frank and his crew as they give a fire safety demonstration, get called to a brush fire and live life in the fire house in Big Frank’s Fire Truck. I had to include this favorite fire engine book: Richard Scarry’s A Day at the Fire Station. Oh so many details to look at. His books always hold a child’s interest for a long, long time and this one is funny too. Includes stickers as a bonus. I am a Fire Truck is told from the perspective of a fire engine, a ladder truck, a fire boat etc. That alone makes it different but even better is that it is a board book that is also shaped like a truck. Not many words in this one. Cute. Another toy book is My Little Red Fire Truck. There are a lot of moving parts in this book. Click the link to watch the video in the review section and see what you think. If you like Lois Lenski you will certainly enjoy The Little Fire Engine. If you are not familiar with her books, you should take a moment to explore them (this will take you to her author page.) This book is part of her Mr. Small series. Mr. Small does it all and becomes the hero of Tinytown. All Aboard Fire Trucks is a Reading Rainbow book (remember those?) What I like about this one is it talks about the different trucks and what they are for. Good for boys who like details. My son loves fire engine books! We’re into Fire Engine Number 9 these days, which is coming out in board book form this fall. Yay! I didn’t know Richard Scarry had a fire engine/house book. We love his books. Thank you for your ideas! Thanks for the comment. Fire Engine Number 9 looks great. Here is my affiliate link for those of you who want to check it out: Fire Engine Number 9 I appreciate you stopping by.